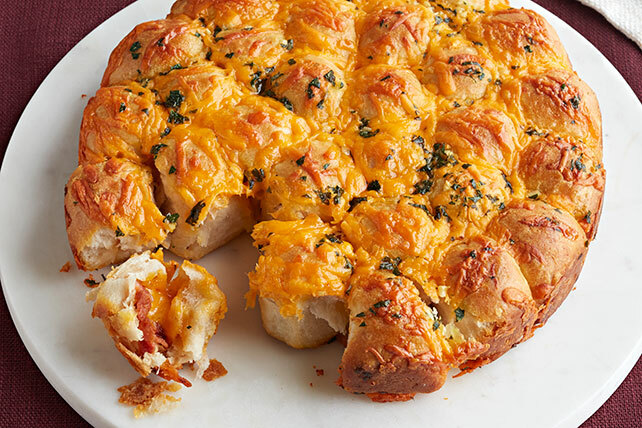 Pull apart a piece of Cheddar-Bacon-Garlic Monkey Bread at your next special occasion. You and your friends will all love this tasty garlic monkey bread! Cut half the cheese into 32 small cubes; shred remaining cheese. Mix butter, garlic and parsley until blended. Drizzle 1 Tbsp. butter mixture onto bottom of 9-inch round pan sprayed with cooking spray. Place 1 each cheese cube and bacon piece on center of each dough piece; press dough around cheese and bacon until completely enclosed. Place in prepared pan. Sprinkle with shredded cheese; drizzle with remaining butter mixture. Bake 35 min. or until golden brown. Cool 10 min. before removing from pan to serve. Since this quick-and-easy recipe makes 12 servings, it's the perfect bread to serve the crowd at your next special occasion. For a touch of heat, prepare using KRAFT Monterey Jack Cheese with Jalapeno Peppers.